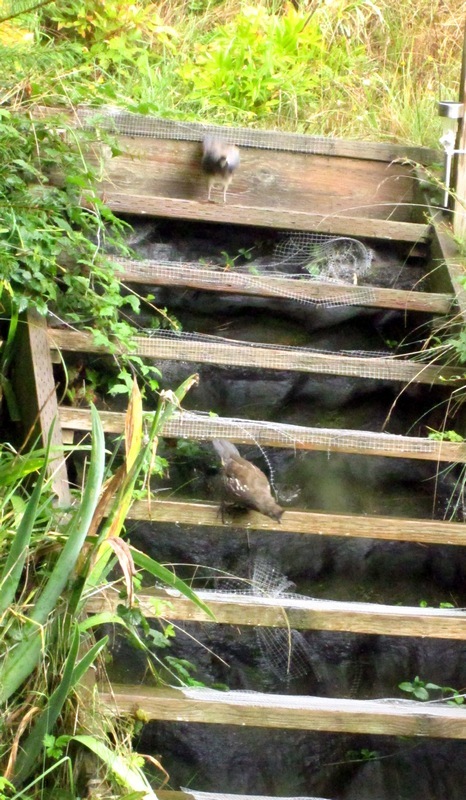 The Island Poetographer VivaVoce: A Waterfall of Quail! In between rain showers, the 3 courts of Quail that we have enjoyed all summer long, descended our garden stairs like a veritable waterfal!. 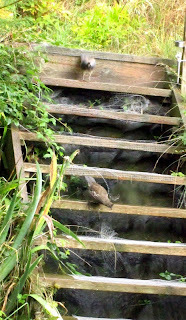 So many brown feathered bodies (I think there might have been at least 30) that the stairs were 'raining quail'. It was a joy to watch them hunt and peck and scratch for cracked corn under the bird feeder. 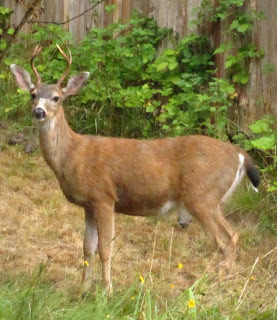 Along with them of course came the Interloper: the other Monarch of the Hill, Buck the Fruit Tree Eating deer! The other night we heard four shots fired from a hunting rifle; we had hopes but to no avail. It appears Buck leads a charmed life (so far). Blessings of a waterfall of whatever delightful birds decide to gift you and may your garden be free of deer!